I got a chance to really dissect this beautiful track by Kevin this week and thought I'd take the time to give a little review as it is very deserving of one! Gameplay - For starters, the gameplay in this track is just awesome. The ramps are some of the cleanest I've ran on and probably the most realistic. You can hit obstacles from almost all directions and experience little to no hang every time. The most hang I've had was just from odd landings or hitting something from an unrealistic angle. One of my favorite parts about the ramp work is the attention to detail. If the angle looks tough to hit then it's going to be tough. Likewise, if it looks simple then chances are you're going to clear it easily. There are no over the top sky wheelies or weak jumps, everything is a fun well designed hit. The gameplay alone would sell me on this track, but apparently that's not enough for Kevin. Detail - I don't think there is one simple word to describe Lucas Oil Stadium and the same principles easily come into MTM2 with this monster of a spectacle. 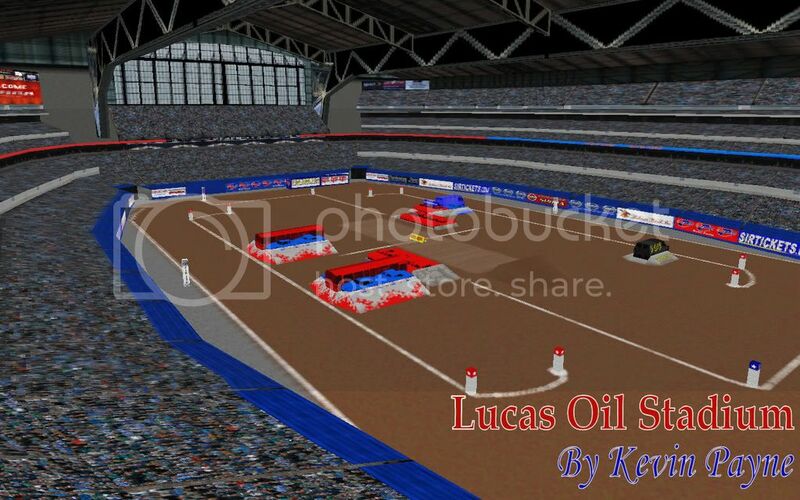 Kevin's replica of Lucas Oil Stadium is truly a land mark in MTM2 stadiums. The modeling detail, the texture detail, and even the size is just aw-inspiring. Thank heavens for digital cameras because without them we would not be able to experience the mass upgrades in MTM2's detail over the years. Keven really took his abilities to the max and took every step necessary to create the 3D equivalence to a masterpiece. Stadium aside, the track is no slacker either. Model detail is top notch as usual with separately crushed vehicles, detailed textures, and precisely placed obstacles. Everything lines up, and is placed to a 'T'. One of my favorite touches is how Kevin placed the cars from the stunt. They are stacked all over each other as if they had really been knocked off before I loaded up freestyle. On top of that, you can run over them from all angles instead of one simple and flat ramp. Hit this pile of horror wrong and you'll be in for a ride! The buses are another thing I was really impressed with. When you hit them it's like I'm actually watching Tom fly through the air. The trucks seam to take the same angles they would in real life and you can get just enough speed to clear them rather than shoot 500 feet through the air. Go too fast and your truck is gonna shoot up and land poorly, but hit it with the right amount of speed and the right angle and you'll be in for a great flight, so to speak. The dirt work isn't the best out there, but it's simplicity is really quite a nice change of pace. Don't get me wrong, there is still a lot of detail in the dirt like dirty edges on the concrete, perfectly placed lines, slightly dirtied up racing textures. I'm obviously a big texture nut, so this is just something I will always bring up. I would preferred to have seen some rooster tails around the turns and starting lines and possibly a part two of freestyle with dirty obstacles. Even so, that does not take away from the track in tiniest bit, not at all! There are some definite pluses on the textures though. They will definitely provide for a minimal lag track and still create a well detailed and enjoyable eye candy. On top of that, there is just so much detail immersing you that it would take you a good hour of entertainment before you even looked at the dirt and I don't expect you'll be disappointed either. Overall Quality - Immortal. By that I mean that the quality of this track will never be outdated. Five years from now I will still be in aw of the track and I know I won't look back and say "Man how times have changed". Kevin, this is truly one of the best tracks made for this game and you deserve a lot of credit for all the slaving and hard work you clearly put into this track. I know a lot of people just take some of these tracks for granted and don't realize how much time is spent on them, but I do and I have a lot of respect for somebody willing to put forth this much effort for free. You are definitely one of the premiere track makers and part of the life force in this game Kevin. Great job! wow that looks awesome compared to all the stadiums I've seen on created, I wish someone made one that good for the Silverdome. I was wondering when you'd finally reply to this topic. LOL.